Looking for a cost-effective fencing solution? This 50 metre package includes 20 of our 2000 Series fence panels, and is the ideal system for a quick and easy temporary fence installation. 50 metre package includes 20 x 2000 Series fence panels, 20 x coupler clamps and 20 x fence feet - everything required for installation! For a simple light duty solution, the Fortress 2000 Series is a light, low cost temporary fencing panel that offers great value. Featuring anti-climb mesh for added security, this sturdy fencing panel is easy to install and will keep your site safe. Plus, it can be installed by just one person. Each panel measures 2.1 metres high and 2.4 metres long, and provides immediate security to your site. This kit includes 20 temporary fence panels, plus the required clamps and bases for installation, making 50 metres of continuous fencing. This kit is ideal for civil construction projects, building and commercial construction, events and environmental protection areas. It can also be used to restrict access around hazards on site. 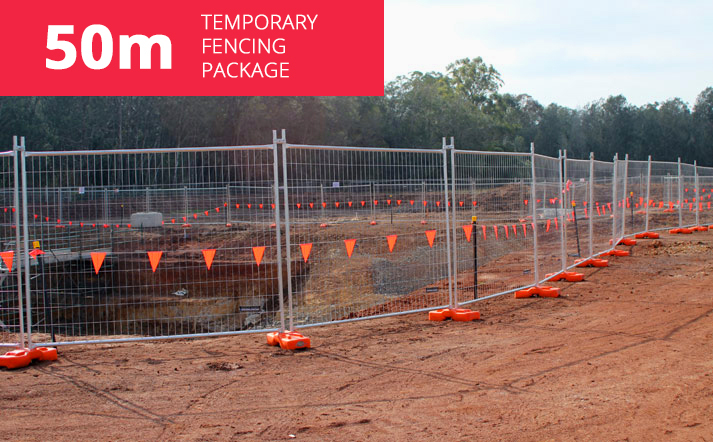 Constructed to meet Australian Standards, the 2000 Series temp fence is tough, lightweight and available now! With extensive stock in all capital cities around Australia including Sydney, Melbourne, Brisbane, Adelaide Perth and Darwin, the 2000 Series is always available for quick dispatch. Fortress Fencing can also provide printed shadecloth, fence mesh, fencing fabric or scrim to promote your brand or project. All our printing is done in house, and we can work with any artwork you require.